Welcome and thank you for your interest in the Global Surgery Fellowship at Rutgers New Jersey Medical School, a program which we are pleased to have recently established. We are offering a non-funded, non-accredited Global Surgery 1-2 year Fellowship at NJMS with the support of the Department of Surgery. We are seeking residents and fellows with a passion for international surgery and who want to become future champions in Global Surgery. Prospective candidates must be in good standing and have successfully compeleted at least two years of clinical training (PGY-3 or higher). This is a hybrid fellowship, where the fellow will be actively participating in 3 areas of Global Surgery: Clinical Care/Service, Education and Research. At the completion of their training, fellows will have the experience and the tools to carry out international surgical missions actively and contribute education, research and capacity building to global surgery as future attending surgeons. Vennila Padmanaban is a general surgery resident and current Benjamin F. Rush Global Surgery Fellow at Rutgers - NJMS. Born in India and raised in Japan, she believes in healthcare as a global, civic responsibility. She attended college at Drexel University, in Philadelphia, where she studied Biology, and received her medical degree from Drexel University College of Medicine. During this time, she served as a summer intern at the Department of Health & Human Services - Health Resources and Services Administration, where she developed a strong interest in the care of underserved populations. As a surgical trainee and research resident her scientific interest is in the substantial need for improved surgical care in resource-poor settings overseas. She is especially interested in the care of women and pediatric patients and in building capacity for advanced surgical technologies. She is an avid Philadelphia sports fan and enjoys Manhattan dining, listening to old-school and contemporary hip-hop, photography and spending time outdoors. The fellow will learn various aspects of mission planning and preparation including selecting proper mission sites, team building, volunteer recruitment and training, as well as communicating with hosting institutions, etc. The fellow will also learn how to lead a surgical team and run a mission. By the end of the year the fellow will be expected to be a mission co-leader and fully understand the complexity of managing and leading an international surgical mission. 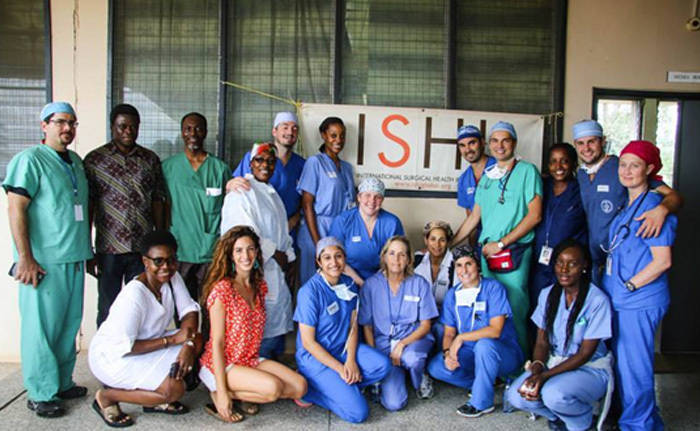 The fellow will participate in 3 to 4 short term International surgical missions per year in collaboration with the International Surgical Health Initiative (ISHI) a NJ based nonprofit organization (www.ishiglobal.org). The fellow’s level of responsibility will gradually increase from mission to mission over the year. During the fellowship these skills will prepare the fellow for international surgical missions as they continue in their future career. The fellow will learn the benefits and limitations of short term surgical missions. In the field: The fellow is responsible for mentoring and working with NJMS and other medical students participating on missions. He/she will organize and provide lectures and training to health care workers from the hosting institutions interested in acquiring surgical knowledge and skills. Local/Regional: The fellow is expected to teach students at NJMS, mentor Global Surgery Health interest groups as well as give formal lectures on Global Surgery at departmental lectures and regional and/or national surgical meetings. The fellow is expected to participate in clinical research, outcomes research or registry data set. They are expected to submit abstracts to regional and national surgical and global health meetings as well as prepare 1-2 manuscripts for publication in peer reviewed journals. Fellows are encouraged to come up with their own research projects or can take on ongoing projects. One-year fellows are encouraged to simultaneously attend courses on Rutgers University online leading to a certificate in Global Health. Two-year fellows are highly encouraged complete an MPH at Rutgers University during their 2 year fellowship.